Mickey and his pals invite everyone to the Mickey Mouse Club House! Three-dimensional Mickey ears helps show the way, and sharp, colorful artwork make participants feel they're at Disney! This jumper features Mickey, Minnie, Daffy, Daisy, Goofy and the Mickey Mouse's faithful pup, Pluto, perfect friends for kids to jump alongside all day! **360-degree mesh windows, so parents and spectators can have a clear view of all the fun. ** Made safe and secure with lite n strong , fire-resistant vinyl making it safer, portable and more durable. 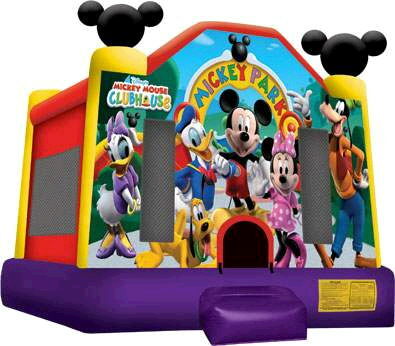 * Please call us for any questions on our mickey park 13 foot x 13 foot bouncer rentals in Rocky Mount and Wilson NC.